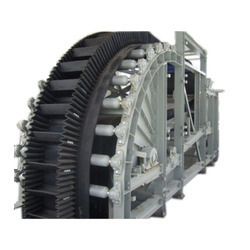 Being a renowned and the most popular enterprises in this industry, offering an optimum quality assortment of Sidewall Conveyor Belt. The product offered by us is protecting the material from friction by solid cleats mounted on the steep angle conveyor belt. Additionally, these belts are designed with two corrugated sidewalls that are moulded to the cross-rigid base belt. Looking for Sidewall Conveyor Belts ?